Waterproof Color Chasing LED Light Strips with Multi Color LEDs - 16.40ft (5m) Outdoor LED Tape Light with 18 SMDs/ft., 3 Chip RGB SMD LED 5050: On Showing Multiple Color Dreamcolor Modes. 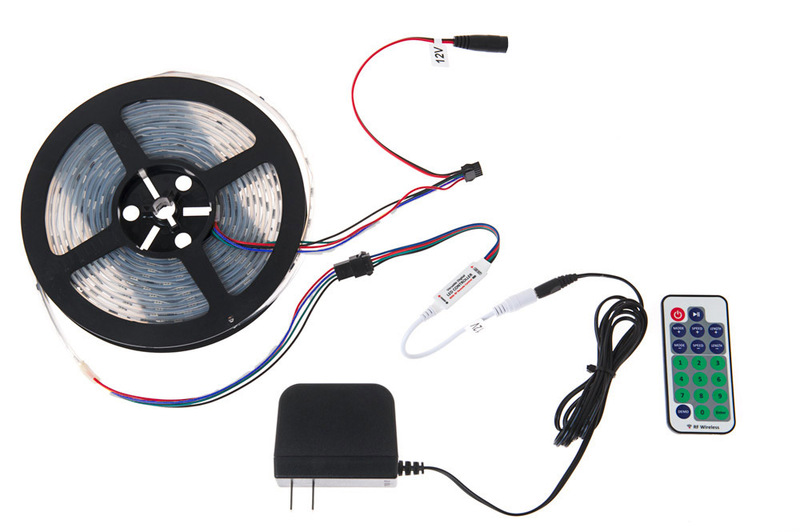 SWDC series Dream-Color Flexible RGB LED Strip - 12 Volt DC: Shown Connected To Power Supply And LED Controller. (Accessories Sold Separately). 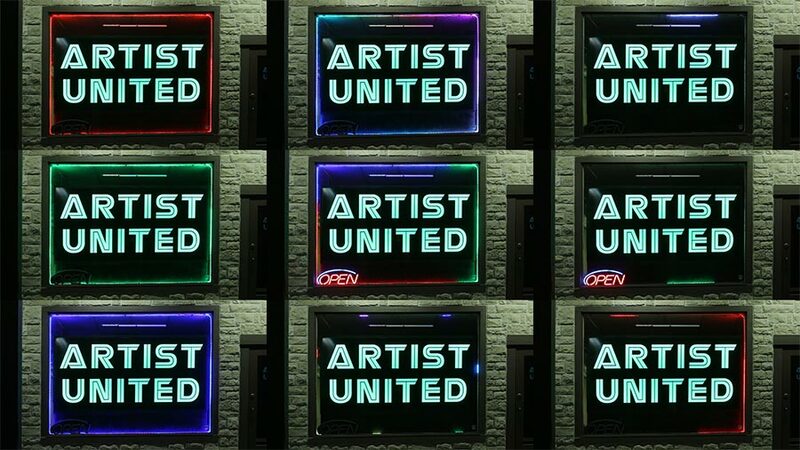 Waterproof Color Chasing LED Light Strips with Multi Color LEDs - 16.40ft (5m) Outdoor LED Tape Light with 18 SMDs/ft., 3 Chip RGB SMD LED 5050: Shown In Various Modes Around Storefront Window. 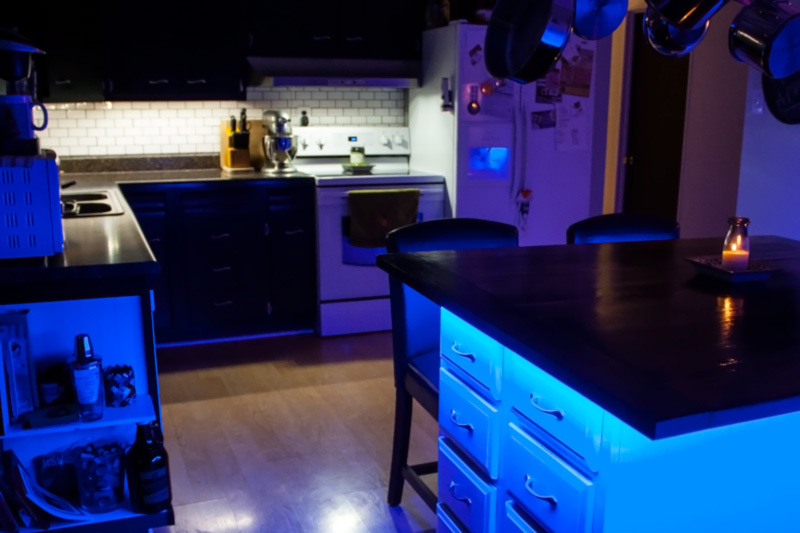 Customer installed color chasing Dream Color LED Strips around kitchen island to create cool accent lighting and floating effect. 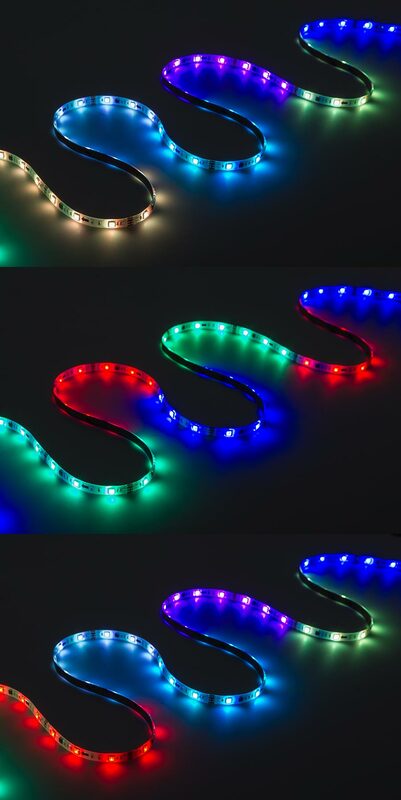 This flexible, waterproof color-chasing LED light strip is perfect for home lighting, under-cabinet lighting, boat lighting, task lighting, vehicle lighting, landscape lighting, motorcycle lighting, bias lighting, and more. 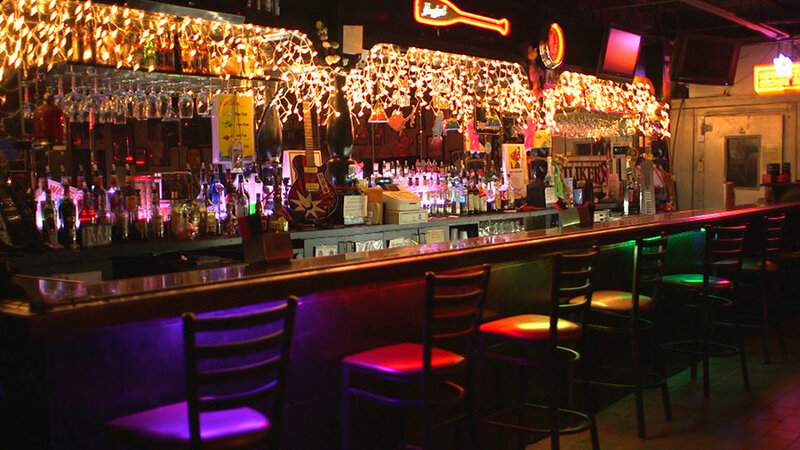 Using 240 RGB LEDs (5050 SMD), the light strip emits up to 600 lumens of powerful illumination. 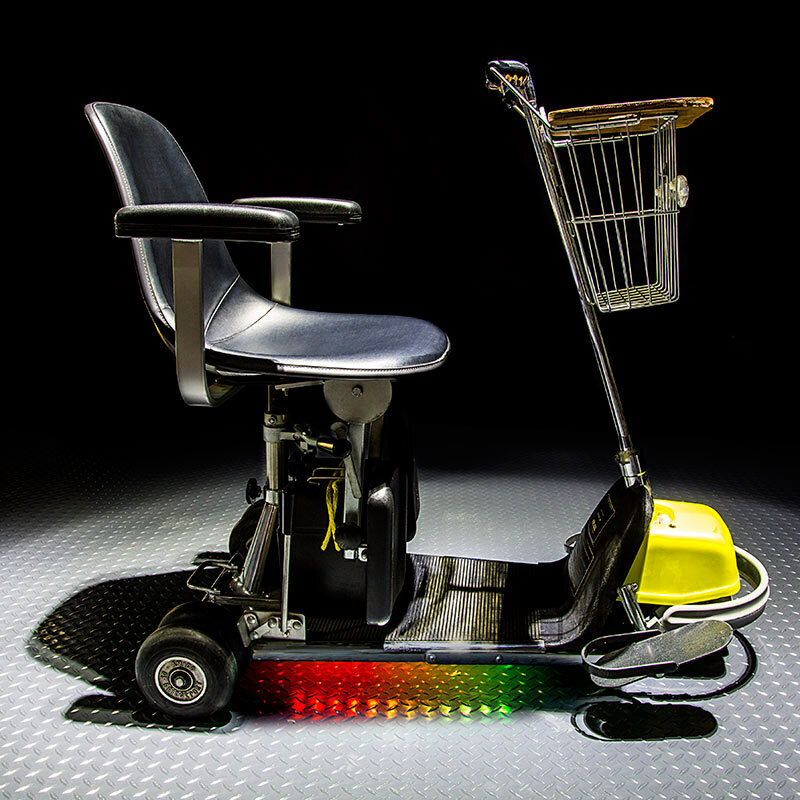 With the Dream-Color Chasing RGB Controller and RF Remote (sold separately), the light strip can provide dynamic color-changing, color-chasing, static, or white modes. 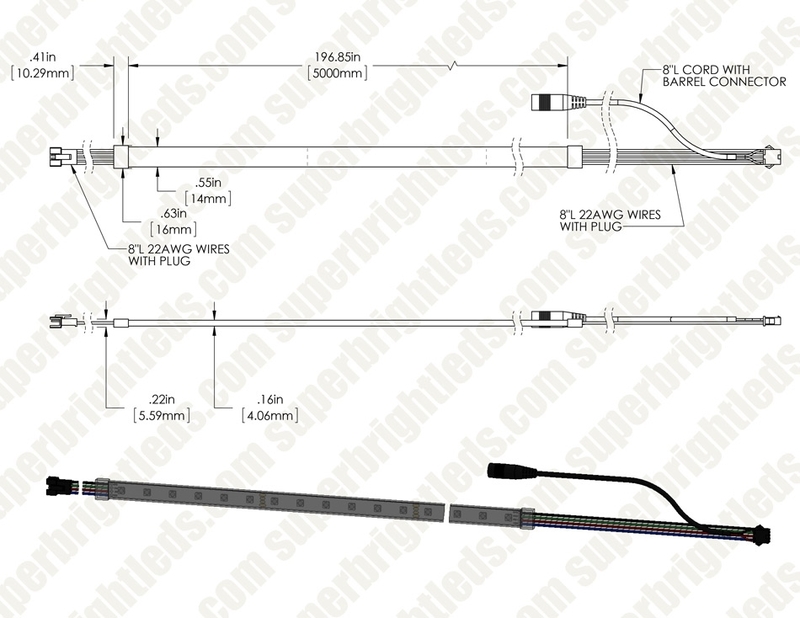 The 16-1/2' LED light strip is encased in silicone and can be easily installed with mounting clips (sold separately). 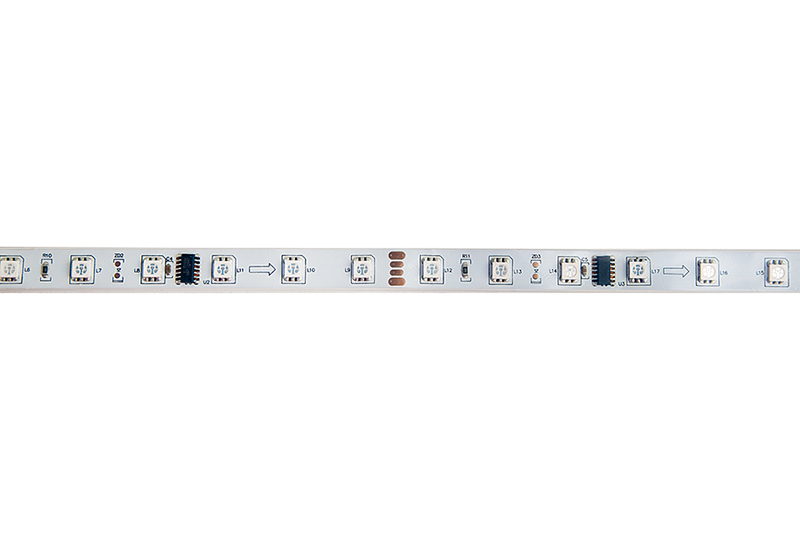 Designed to last 40,000 hours, the RGB LED light strip has 12V DC operation and connectors on both ends for power and data. SWDC-RGB-240 - Outdoor RGB LED Strip Lights - Color Chasing 12V LED Tape Light - Waterproof - 37 Lumens/ft. Fired them up on the spool it comes on and was not impressed. When I rolled the strip out on the floor, it was a totally different story. SBL lives up to their name on this one. It's really, really bright. Don't stare at it for too long. I got this strip and the controller to put some bling bling on my RC quad copter fleet. 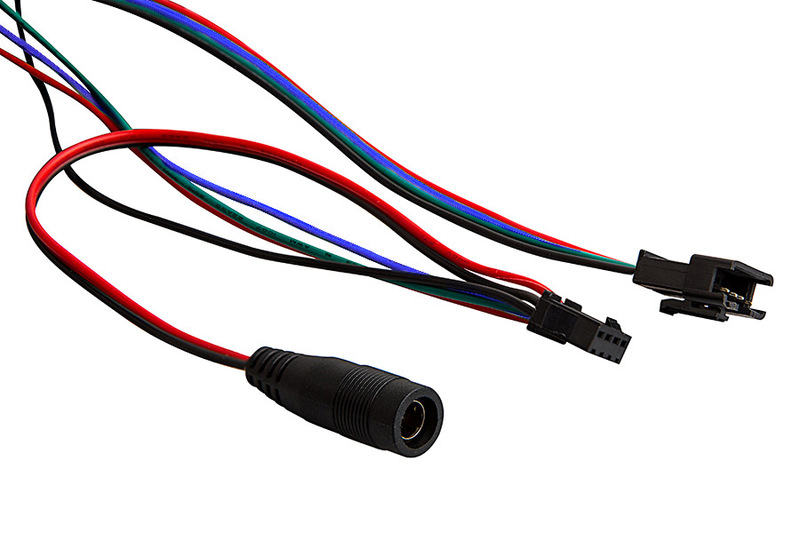 Other quad drivers use always on one color strips. Wonder how they're going to react to a flying light show? I have to say something about the staff at SBL. I am not only impressed by the product, but equally as much by the great service. Somebody forgot to include the batteries for the controller and all it took was a quick email. They jumped all over it and mailed them right out. Now all that's left is to figure how to install the strip on my quad copter. 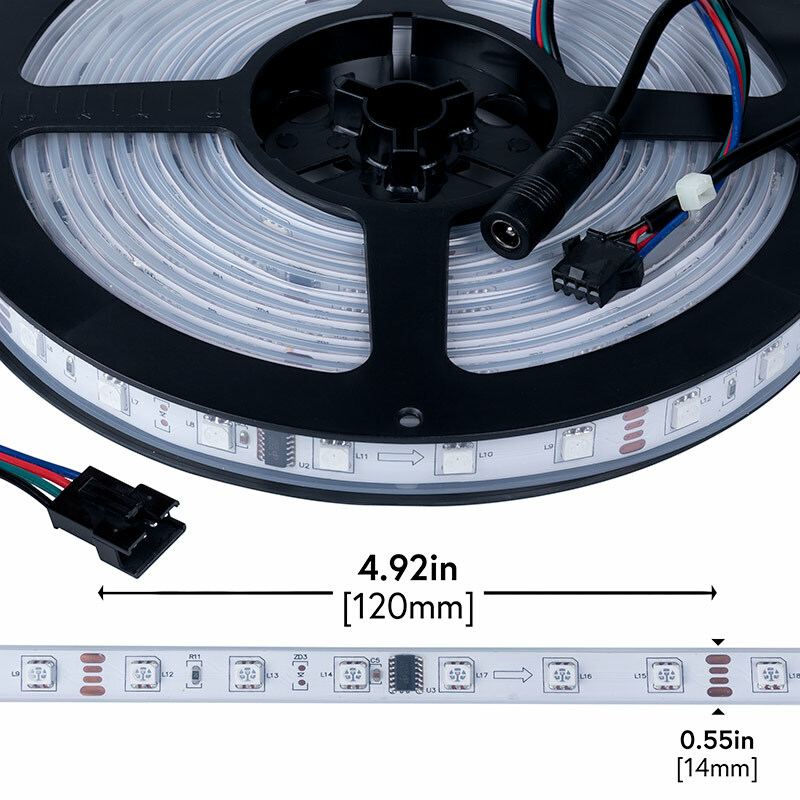 This is a great looking LED strip, bright and well functioning. 2. The waterproof sheath seems to be made of silicone and nothing likes to stick to it. So most double sided tape doesn't work. Carpet tape worked better than any other I tried. I ended up using clips, wire ties, and silicone caulk.